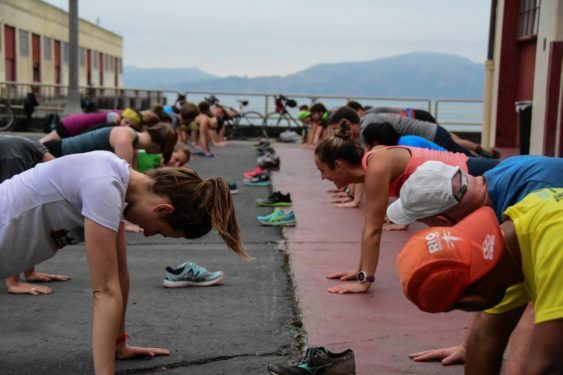 Every Monday, November Project San Francisco meets in Dolores Park for a combination of cardio and strength exercises that are sure to leave you stronger than the day before. Come at 6:30 am; meet at Dolores Park for hugs, sweat and cheers. The workouts are weatherproof, meaning they’re always on, but you can check on Facebook as they post a status the night before to confirm. The workouts are always free and they encourage all athletic abilities to join. There are no weights or accessories involved; you will only find body weight and partner assisted exercises here. The group is less of a boot camp and more of a close community of friends who encourage each other to push harder and keep each other accountable. November Project is a fitness movement that was born in Boston as a way to stay in shape during cold New England months. Now present in multiple cities around the world, the movement is using a simple sense of accountability to motivate and encourage people of all ages, shapes, sizes and fitness levels to get out of their beds and get moving. Members vary from Olympic medalists, professional athletes, marathoners, triathletes, current and former collegiate athletes all the way to complete fitness rookies and recent couch potatoes just looking to kickstart their healthy life choices. If you think that you’re not fit enough to join the group, stop thinking and come see what the fuss is all about. How can you join? Simple…Just show up.